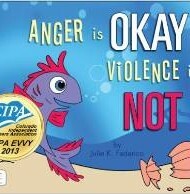 Anger is OKAY, Violence is NOT, written by Julie Federico and illustrated by Glori Alexander, is a thoughtful, much-needed addition to pre-school teachers’ and social workers’ libraries. With vibrant, TV-cartoon-like illustrations and simple, direct text appropriate for even the youngest children, this picture book explores the complexity and vitality of anger, and when it is appropriately expressed and when it is not. Clear language and child-friendly art invite a direct, straightforward examination of when anger is appropriate and how to safely express it through art, physical activity, tears. What’s not OK is hitting, biting, throwing and hurting. The book gently and clearly reminds its vulnerable audience that adults can find the journey just as tricky as children do. If an adult hurts a child or someone they love, Federico instructs her young readers that telling a trusted adult is a safe and right action for them to take. Needless to say, this is complex emotional territory, and Federico’s tone is perfect: even, loving, simple, clear. Educators and caregivers may well find this a helpful tool in eliciting important conversations, and the book includes contact information for The National Domestic Violence Hotline and other respected sources of support.